The online application form for the BSNL JTO Recruitment 2017 is now available from March 6. 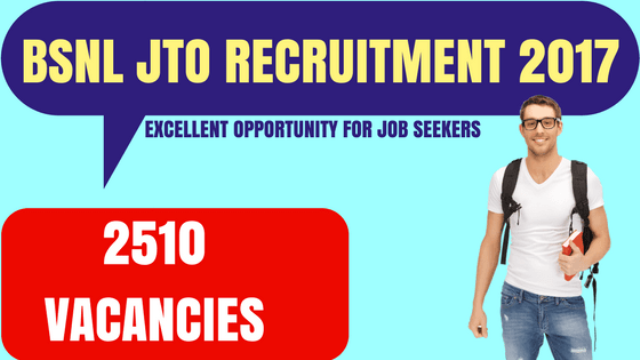 The last date to apply BSNL JTO Recruitment 2017 is April 6. Bharat Sanchar Nigam Limited (BSNL) has announced to recruitment of 2510 JTOs through GATE 2017 score. Candidates can register for BSNL JTO Recruitment through GATE 2017 from this page. Bharat Sanchar Nigam Limited (BSNL) will be recruiting Junior Telecom Officers (JTO) in the discipplines of Telecom, Electronics, Electrical, Radio, Computer Science, Information Technology, Instrumentation Engineering on the basis of valid GATE 2017 scores. Candidates having M.Sc. Degree in Electronics/Computer Science are also eligible.There will be no interview for this recruitment and it will solely be on the basis of the GATE scores of the candidates. The BSNL will be hiring 2,510 graduate engineers for the post of JTOs making it the largest recruitment through GATE 2017. Candidates are required to appear for GATE 2017 in order to be considered eligible for recruitment. The application forms will be online and candidates will have to fill the online application after entering the GATE registration No which will be mentioned on the GATE 2017 Admit Card of the candidates. Check below the detailed information for the BSNL JTO Recruitment 2017 such as eligibility criteria, important dates, selection process, application process etc. Application Fee: Rs 500 for GEn/OBC candidates and Rs 300 for SC/STcandidates. The registration No that is mentioned in the GATE 2017 Admit Card must be entered. Candidates also must enter their personal details as well as the academic qualifications along with other details as instructed. They must make the payment as specified above. They must submit the details and save a copy of the printed application.